“It is possible that a year ago some of you might have not even heard the term ‘Brexit,’” Notre Dame political science Professor A. James McAdams said last Monday, kicking off a panel discussion of the United Kingdom’s democratic decision in June to leave the European Union. As a matter of fact, I had. Being a European and, more specifically, a Dane, the question of what will happen now that my old neighbor country is leaving the association of European states it joined in 1973 is important to me, and not only out of sentiment or nostalgia. Brexit is likely to have consequences for me, for other Europeans and for everybody on this side of the Atlantic as well. 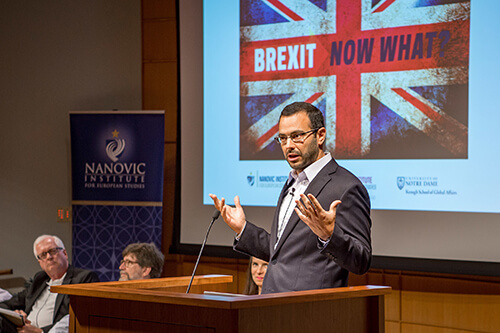 So I was keen to hear answers to the question, “Brexit: Now What?” that McAdams as director of the Nanovic Institute for European Studies had posed to his lineup of four experts on European politics and global economics. European nations want their sovereignty back, Rosato said. When the EU was founded in the late 1950s, it made sense for European nations to give up some sovereignty because of the threat posed by the Soviet Union. When communism failed 30 years later, it made sense to keep going simply because the EU was doing very well. But that began to change around the year 2000, he added, and the decline in popular support for the union accelerated with the financial crisis in 2008 – many Europeans disagreed with how the EU has handled the crisis. Growing up in Denmark, I felt this change. Rosato’s observation about nationalism rings true. It’s great to be able to cross borders freely. Free trade and broader employment opportunities are certainly benefits of the partnership, and for what is likely the first time in history, three generations in all but a few European countries have grown up in peace. But for me, that’s where it ends. Denmark was hurt by the 2008 crisis. Being realistic about the future, in my view, my country was able to cut public expenses and keep going without being hit too hard. It seems unfair to me that we should pay for the fact that Spaniards, Italians and Greeks have lived beyond their means. One of those was Rosato’s mother. The day after the vote she answered her son’s phone call, shouting “We won, we won, we won!” Learning that his mother had voted to leave was a disappointment to Rosato, whose parents own a farm supported by EU subsidies. “So my inheritance . . . is gone,” he explained to the audience’s amusement. Rosato does not see Brexit as the end of the world — or even of Europe. European countries will continue to cooperate. But they will do so as nation states, not as parts of a European Union, he told the audience. “A couple of years from now I wouldn’t be surprised if we’re talking about a renegotiated EU, or we’re talking about Frexit, Nexit, Grexit — QuItaly,” he said, provoking the loudest laughter of the afternoon. Not so, responded political science Professor Emilia Justyna Powell, originally from Poland, to Rosato’s prediction. She reminded the audience that the Brexit vote was only advisory, meaning that it is now up to the British government to negotiate how to leave and how to work with the EU after they do. “I will not be surprised if in two-to-three years we’re going to have this panel again, saying ‘It’s been a drawn out process and not much has changed,’” she said. She finds it especially unlikely that eastern and central European countries will follow Britain’s lead because they have too much to gain from the union. Poles were unhappy with Brexit because Britain has been one of Poland’s strongest allies against so-called “Brussels federalism,” a term Powell used to describe a trend similar to some American politicians’ one size fits all-solutions coming out of Washington, D.C. But, she said, Britain is still in the EU and can continue to be an ally for a while. Jeffrey Bergstrand, a professor of finance and economics, focused on the decision’s financial implications for Britain. Stock prices in the United Kingdom dropped dramatically after Brexit but then rebounded, he said, and the stock market has delivered a 10 percent return so far in 2016. On the other hand, the pound has fallen 15 percent, as has therefore the value of tradeable goods. The upside, he said, is that currency depreciation helps a nation’s economy. Even though less money will be invested in Britain for a while, the weaker currency should boost exports. On balance, though, Bergstrand is clearly worried about the future. “This is very dangerous. This is one of the most respected economies in the world going down a dark path,” he said, likening the potential result to the precedent of the 1920s and 1930s when many countries repeatedly raised tariffs on foreign trade, creating yet another economic problem that led to a historic recession and depression. “And that’s a very, very concerning and worrisome thought,” he said. All things considered, one student asked, who, other than British Conservatives and possibly Professor Rosato’s mother, benefits from Brexit? “And also, maybe, Dublin,” added Bergstrand, giving the ending of the panel discussion — and this story — an Irish connection. Originally published by Rasmus Jorgensen at magazine.nd.edu on September 02, 2016.